6 - 9 years old. The foundation in self initiation, concentration, intrinsic motivation, creativity, and academic skill laid in the early years is built upon with amazing effect during the elementary grades. Your child can continue his or her education within environments that are as equally carefully prepared and shaped to match developmental needs and abilities as in the primary classes. The curriculum and environment - designed to be completed over a three year period - is carefully structured and designed for children to experience both challenge and success at all levels. In addition to the benefits gained from the individual and small group instruction, the three year work cycle enables all children to work at their own pace, directed by personal interests. Instead of “teaching to the middle” (the education practice of teaching to the average student level in the class, resulting in boredom for those who are more experienced and frustration for those who are less experienced with the subject), the students receive individual lessons targeted at helping the child reach the next step in his or her own development. 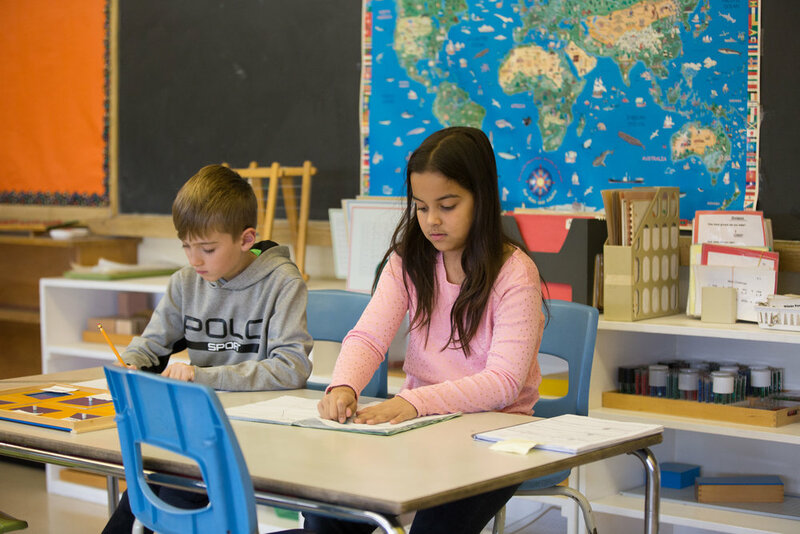 Students are assessed on an ongoing basis to determine comprehension of concepts, level of skill, and the appropriate progression for that individual child. At this stage, the development of practical life skills related to time management, organization, seeking help as needed, and personal responsibility are emphasized. Children are encouraged to start to be responsible for their assignments, to prioritize choice of activities, and to engage in social problem solving and resolution. Mathematical operations and concepts are discovered through practice with specialized materials. These hands-on activities provide opportunity to actually discover the meaning of operations, not simply memorize rules. Using a variety of materials, each child has concrete experiences with adding, subtracting, multiplying and dividing, and can recognize similarities and equivalencies in two and three dimensional shapes. These experiences are used to gradually bridge from the concrete to the symbolic as the child masters the concepts. The math curriculum is designed to meet all academic learning styles and abilities. The child who requires additional time to fully understand a concept will have that time. Children who grasp the concept quickly and are ready for more challenging work will move on to new challenges. Over the elementary years, children will work with the four operations: addition, subtraction, multiplication, and division using whole numbers, decimals and fractions. They will also discover the rules for factors and multiples, use numbers as data and present information in graphs and charts, measure and explore angles and geometric shapes, and understand concepts of equivalency, congruency, symmetry and similarity. They will progress, during the Upper Elementary years, to in-depth understanding of abstract concepts and theorems, pre-algebra and algebra, statistics, and geometry. Children use their growing language and mathematical skills to explore topics of science and culture. Encouraged to research topics of particular interest to themselves, there is no limit to the range of projects that will be undertaken. The integrated curriculum explores history, geography, science, anthropology, commerce, literature, the arts, and music. History is introduced through the use of large time-lines that give children a visual impression of pre-historic life, the world of early people on earth and the emergence of some of the first civilizations. Geography materials illustrate the birth of planet Earth, its place in the universe, and how it contributed to the history of humankind. Science experiments help the child to understand the laws of the Universe, including the rotation of the Earth, friction, gravity, and the interdependence of species. As the students move into the Upper Elementary level, they begin to use experimental methods to study the natural sciences. Hypotheses are developed, experiments are designed to test assumptions, data is observed and analyzed, and conclusions are presented in formal scientific reports. The character building aspect of the curriculum recognizes the child’s early interest in an ethical value system and social rules in the community. As the children work collaboratively together, they also learn to live together in a community. Focus is placed on negotiation of social issues with appropriate adult support. Children learn conflict resolution skills, appreciation and respect for individual differences, and responsibility for each other and their environment. Children are also taking on increasing independence and responsibility for their learning, making choices about activities, completing tasks, and understanding natural consequences of choices. The students also have the opportunity to practice daily skills in the community and will often arrange small outings to purchase food for class pets, to attend particular events, libraries or galleries, or to complete research projects. The progression through the Lower and Upper Elementary years enables our students to explore endless topics and subjects, while building essential skills for lifetime learning and development. The Elementary Montessori Curriculum is vast and includes Language, Math, Science, Social and Cultural Studies. There is also an intentional approach to moral character development and practical life skills. The curriculum is presented in a variety of ways – through individual and small group lessons specific to particular tasks and skills, and through the annual repeated presentation of the Five Great Lessons to the entire class. The Great Lessons are an important and unique part of the Montessori curriculum. Presented as stories with demonstrations and illustrations, these lessons are designed to capture the children’s imagination and inspire exploration. Traditionally presented in lower elementary, they are presented annually so that children see them more than once. This allows them to experience different aspects of the lesson as their own abilities and awareness have developed. Through these lessons, the elementary child is introduced to a large framework of life, which then allows for the inclusion of the smaller ideas and pieces that form that frame. The Coming of the Universe and the Earth, leading to the study of astronomy, meterorolgy, chemistry, physics, geology, and geography. The Coming of Life, inspiring the study of biology, botany, habitats, ancient life, and animals. The Coming of Human Beings, a story presented in a Timeline, leading to further study of history, culture, social studies, invention and scientific revolution. The Story of Writing (Communication in Signs), promoting the study of reading, writing, language, and the structure of languages. The Story of Numbers, encouraging the exploration of of mathematics, origins of numbers and scientific notation, geometry, and the daily use of mathematics. Inspired by the Great Lessons, the children engage in the daily work of learning. In each area of focus, the curriculum offers an intentionally structured and progressive program of skill development. These skills are repeatedly practiced in all areas of the curriculum, and true integration of learning occurs. For example, essential language abilities are used to research and present topics of science; the study of geography naturally leads to the building of graphs and charts; the study of an animal delves into art, biology, botany, history, and zoology. Building naturally on the literacy skills acquired in the Casa program, children develop their language through daily writing and reading tasks. They write every day and on many topics. The rules of written language punctuation, capitalization, spelling and sentence structure are taught as specific lessons and then applied to the child’s own work. Oral language skills are built through presentations to peers. At the completion of the three year cycle at the Lower Elementary level, the child is expected to read fluently and understand simple chapter and information books. They are also expected to gather and organize information from a variety of sources, use the conventions of writing accurately and make clear oral presentations to the class. They continue to expand their abilities through the Upper Elementary years, using language to creatively express ideas, communicate across a range of subjects, and comprehend information from a variety of sources. Learn more about our amazing teachers.